Today Kish decided to join me at the office and brought along some cleaning supplies. During her visit, I heard just about every synonym for “dirty” you can imagine. Filthy. Disgusting. Grimy. Ridiculous. Dusty. Obscene. Soiled. Appalling. Squalid. Oh my God, would you look at the amount of dust and dirt on this cloth!!!!!!!! Well, the last one isn’t quite a synonym, but you get the idea. It was directed at the condition of my keyboard, mouse, and mouse pad, which admitted were looking a bit well used and were caked with what looked like a troll’s earwax. That is not to say that our office cleaning crew does not visit my office, but their once-overs just don’t get to the level of things like bookshelves, door knobs, phone buttons, or computer mouses. And how many office workers really pay much attention to the condition of their workplaces? Sometimes it takes a fresh eye to put it all into the proper filthiness perspective. Now everything in the office has been cleaned with tender loving care, and my workspace has that brisk, sharp but not unpleasant Clorox disinfectant wipes scent. I feel more productive already. Lately there has been an explosion of stand-up desks at our office. Old-fashioned sit-down desks — the kind that I use — are increasingly being replaced by adjustable desks that allow you to move your computer from a desktop location to stand-height. I’ve gotten used to walking past offices and seeing people standing rigidly behind their desks, starting at their computer screens and clicking on their mouses. Several people in our office have gone even farther, and opted for non-adjustable, permanent stand-up desks — but even that might not be enough for the true believers. The last time I was in the office of the Biking Brewer, for example, he not only had a permanent stand-up desk, he had no chairs of any kind in his workspace, explaining that if he had a chair he might be tempted to sit in it. So, the last time I stopped in to talk, I ended up kind of perching on a narrow window ledge during our conversation. If you ask the stand-up crew why they’ve chosen these new desks, the inevitable response is “because it’s healthier.” You’ll hear about burning more calories by standing than sitting, and avoiding heart and back problems, and enhancing bone density, but all of the rationales asserts that stand-up desks are healthier than sit-down desks. Researchers are starting to question whether the stand-up desks — or for that matter treadmill desks, or exercise-bike desks — really make an appreciable difference. The studies that purport to show that stand-up desks make a positive health difference have been found to be small and poorly designed, and health researchers note that standing for long period can have adverse health consequences — like causing enlarged veins. Enlarged veins? That sounds vaguely disgusting. Of course, people should try to move around at work. Take the stairs rather than the elevator. Consider whether you should walk to a co-worker’s office rather than sending an email or making a call. Get away from your desk and walk during the noon hour. But let’s have a little skepticism about studies that purport to show that stand-up desks are the key to office good health. In fact, the health researchers quoted in the news article linked above says that most of impetus for stand-up desks right now is that they are “fashionable.” I’ll say! But I’ll gladly resist the trend and just plop my keister down in my comfortable chair at my desk before I get to work. I have a bowl in my office, on a table between two chairs. 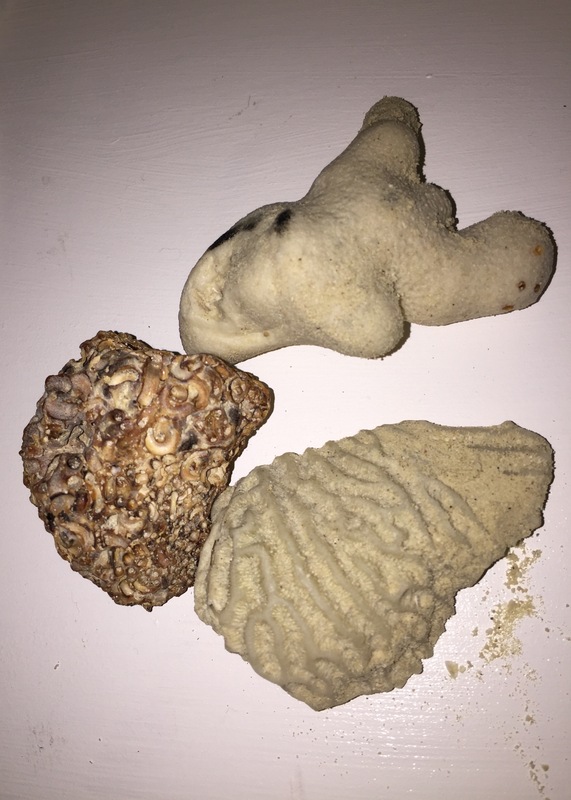 Every time I take a trip to a beach, I bring back a shell (or three) to add to the bowl. It’s a little bit of whimsy in an otherwise functional office, and a pleasant, physical reminder of relaxed, carefree times. I don’t try to bring back perfect shells — that would be frustrating and defeat the purpose — but rather shells that, because of their color or texture or shape, just caught my eye as I walked on the sand. This trip it’s a coral theme, with a ridged piece of brain coral, a reddish piece that is shot through with holes, and a globby item that somehow reminds me of a ghost. Last night was Beggars’ Night, and we bought too much candy. 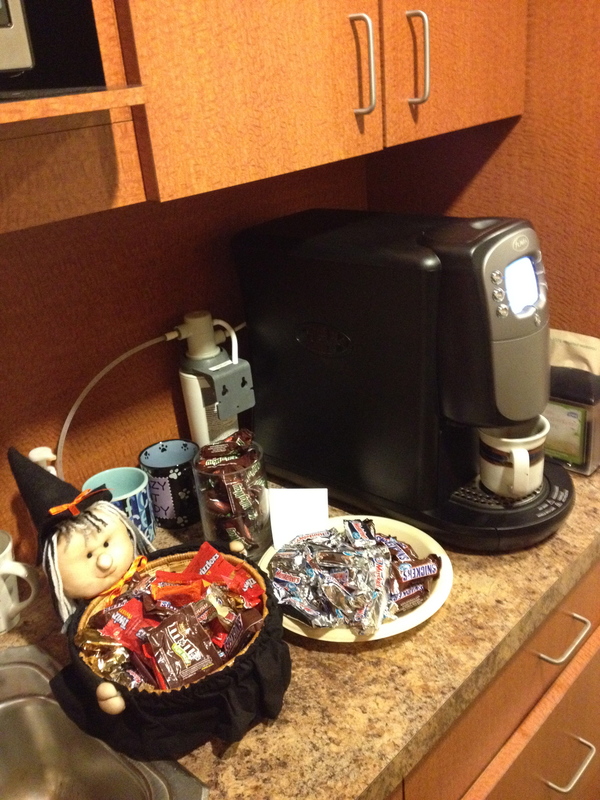 (We had no trick-or-treaters at all visit our new house, so any candy would have been too much.) Kish’s edict was unequivocal: get the candy out of the house, immediately! So, to the office and the counter next to the fifth floor coffee station it went. 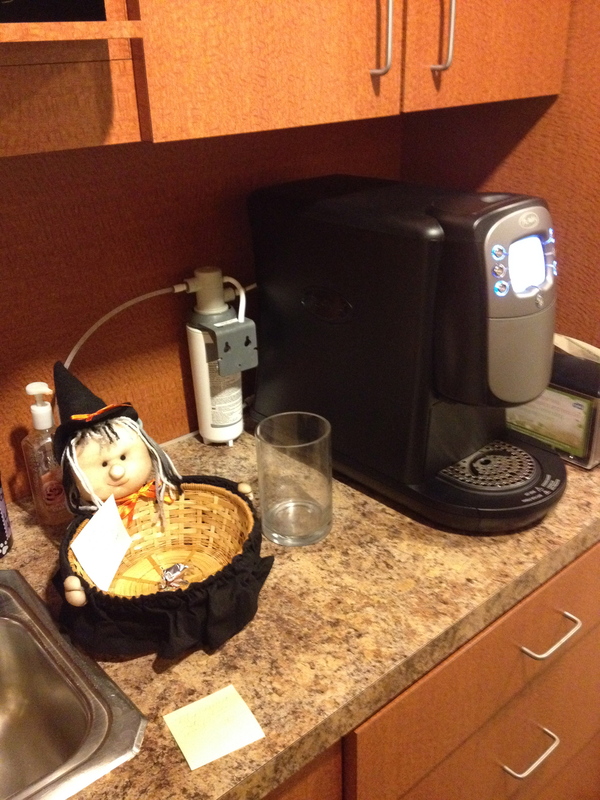 By 8 a.m., another of my office mates, who had a cool witch serving bowl, also had weighed in with her extras, and the coffee station was ready for the inevitable onslaught. I’m guessing that this same scene was duplicated in countless offices around the country. By 1:30 the hungry denizens of the fifth floor had made an appreciably large dent in the candy supplies. The Snickers bars were the first to go, followed by M&Ms and Milky Ways, and the Three Musketeers bars were bringing up the rear. There was a huge post-lunch, “its-kind-of-like-a-dessert-so-its-OK-for-me-to-have-one-or-two” rush on the candy, and one grateful consumer left a nice thank-you note. By 4 p.m., the human tide had subsided. Only a few lonely, somewhat pathetic-looking candies remained in the witch’s straw bowl. The plate had been removed entirely, and the jar was empty. Even the boring Three Musketeers bars had been consumed by the chocolate-craving occupants of the fifth floor — if not by colleagues on other floors who heard through the grapevine that there were good candy pickins on 5. 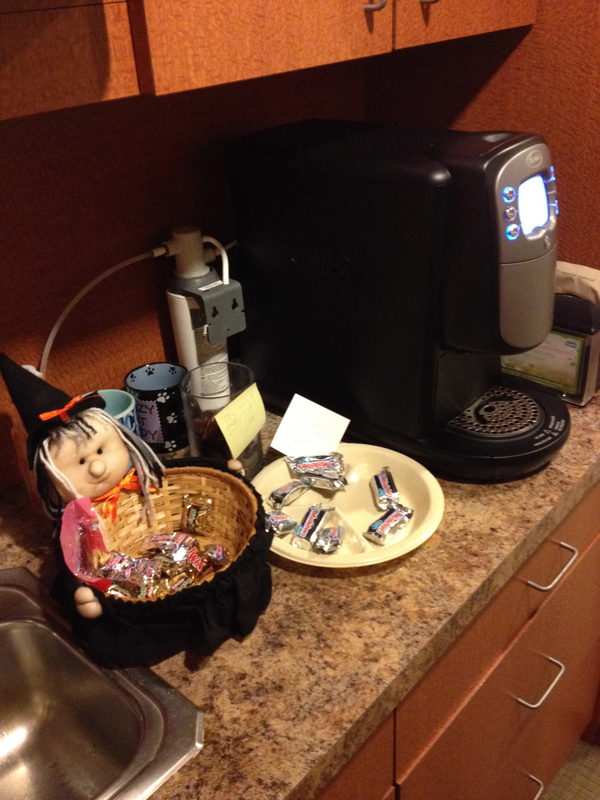 How much candy do you suppose is consumed in offices on the day after Beggars’ Night, anyway? If you work in an office environment, you’re likely aware of a curious phenomenon when people try to proofread their own work. Some people can do it effectively. Others can’t. The psychologists among us explain that people in the latter class, when creating their work, see a flawless, excellent product in their heads and assume that that is what they are keyboarding. Then, even though typing mistakes get made and everyone’s writing could use some editing, when they try to proofread their eyes don’t communicate reality back to their brains. Instead, they skip over the grammatical errors, misspellings, and typos, think of what they intended to write rather than what actually appears on paper, and see an immaculate piece of work. Life as a whole seems to be that way, too. Some people have a sense of self-awareness that allows them to proof their lives just like they would proof a memo at the office. They see where they have made mistakes and gone astray and worked to make corrections. In fact, some people are so proficient at personal proofreading that they can do it in real time, self-editing their statements as they are being made and modifying their behavior as it is occurring. It’s fascinating to watch these people internally debate about word choices and weigh one approach against the other before making their decision. But then there are those who seem to be utterly incapable of self-proofreading. They’ve decided on a course of action and they’re going to stick with it, oblivious to the verbal cues and physical reactions of the people around them that say they’re on the wrong path. It’s as if the some internal buzzing in their brains interferes with the basic sense of self-awareness that keeps humans from walking into heavy traffic or jumping into a shark tank. These people may not think they’re infallible — not quite — but they believe that they’ve thought things through and considered all of the options, they’ve rationalized their ultimate decision, and they just can’t see any other way. And when unexpected or bad things happen, they’re blamed on rotten luck, or bias, or unfairness. Sometimes only catastrophe can cause them to finally deviate from their chosen course and realize that maybe the problem can be found in the mirror. The older I’ve gotten, the more I think proofreading is a really valuable skill. 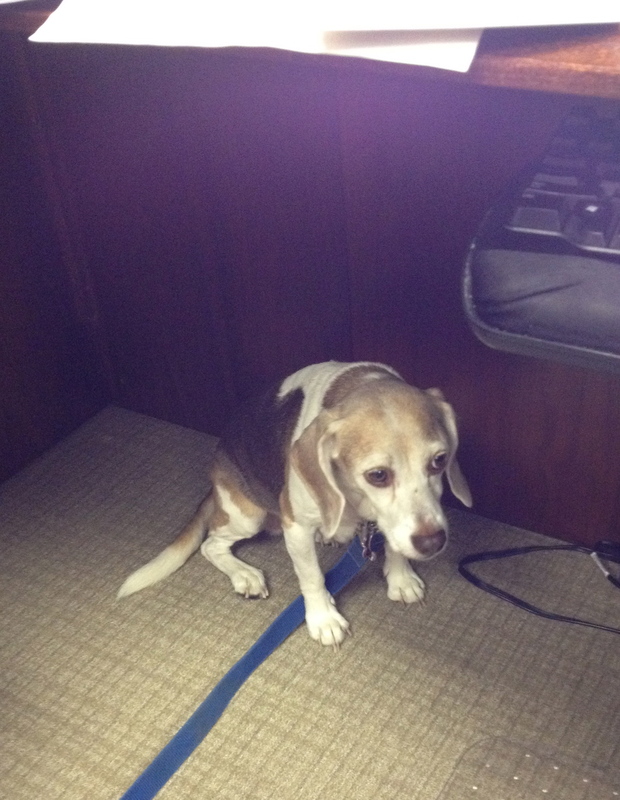 Kasey came to the office with me today and decided that the little nook right underneath my desk was a good place to camp out. She doesn’t particularly care for the elevator ride up to my fifth-floor workplace, but she likes the walk to the downtown area and the feel of my office carpeting just fine. Recently I received an email at work from outside the office that had an emoticon at the end of it — I think it was the ever-present winker — and I groaned inwardly. Is nothing sacred? 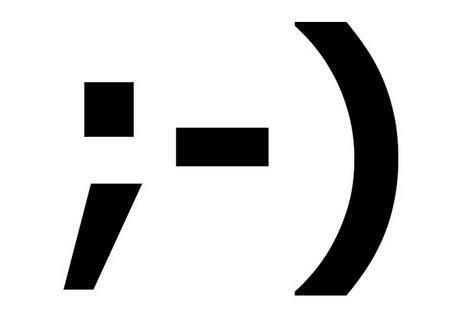 Is there no place that can’t be invaded by the emoticon wave? I admit that it’s odd to think of the workplace emailbox as sacred ground, but you’ve got to draw the line somewhere. I am not a big fan of emoticons, because I think they tend to trivialize and infantilize our communications. There is a time and a place to be slouchy and casual, and a time and place to be more formal and serious. In my book, the workplace should fall into the latter category, and work-related communications should reflect that reality. The office is where people are supposed to go to work, not exchange winks. I admit, too, that I often don’t know precisely what emoticons are supposed to mean. Does a person put the smiler emoticon at the end of a message to make sure that you know that their message is supposed to be funny? Is it now universally accepted that you can write something harsh but use the winker emoticon as a tag line, and everyone is supposed to understand it’s all just a joke and take no offense? Is the emoticon supposed to substitute for the facial expression the email writer would be making if we were sitting across from each other? If so, how am I supposed to take the stupid face-with-tongue-out emoticon? I get the sense that we’re in a period of severe emoticon creep, so now is the time for those of us who want to maintain the office as an emoticonless sanctuary to pay special attention. Eternal vigilance is the price of winker-free communications.